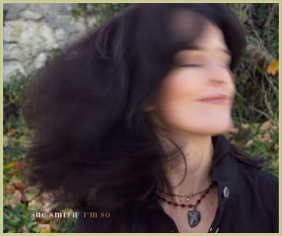 Written and produced by Sue Smith. I’M SO, a collection of 11 new songs, is Sue’s first musical offering after an extensive period focussing on teaching, dance studies and her fascination with whales. Taking inspiration from northern landscape, singing lessons, dance, introspection and a renewed curiosity in the pop song format, Sue began an intensive writing period, working at her Bell piano, playing, singing, listening, seeking. Initially intended as a demo, I’M SO took on a life of its own, demanding musical attentions beyond the piano and voice. Two years in the making, the CD collected the fine musicianship of Davide DiRenzo, drums and percussion; Jeff Bird, mandolin, percussion, electric bass; Russ Boswell, electric and upright bass; Rusty McCarthy, electric and acoustic guitars, Scott Merritt, keyboards; Torben Markussen-Brown, acoustic guitar; Richard Bell, organ; Leo Valvassori, bass and cello, Nick Craine, vocals; and Frank Evans, banjo. I’M SO was mixed by Jeff Wolpert, Desert Fish, Toronto, and mastered by Joao Carvalho, Joao Carvalho Mastering, Toronto. The result is a fine sounding collection of fresh roots/pop tunes and delicate ballads – sometimes winsome and forlorn, always heartfelt. Songs explore the passion of landscape and the thrill of dance intermingled with the the journey of relationship; the desire that insists on hellos and the circumstances that necessitate good-byes, and always love; the force of life in all its glories, desperations and hopes.